Situated on an island setting in the heart of the Delamere Forest, Nunsmere Hall is a magical North West wedding venue. This 19th century country house has a long history of hosting glittering parties for over 200 years, making it a truly special venue for your wedding day. Exclusive use, a ceremony capacity of 150, a dining capacity of 220, and 36 double bedrooms for guest accommodation are just a handful of some the amazing features of Nunsmere Hall. Explore Nunsmere Hall here. For the most idyllic views of Cheshire, it doesn’t get much better than the magical Peckforton Castle. With only one wedding per day at the castle you can be confident that the elegant, romantic atmosphere you want is created for all your guests in the rooms you are using. Exclusive use of the entire venue is also available for couples after that extra bit of privacy and excitement on their big day. Fantastic features of the castle also include a ceremony capacity of 120, a dining capacity of 160, and 48 double bedrooms. Explore Peckforton Castle here. Nestled into the heart of Warrington, Combermere Abbey Estate is a tranquil and gorgeous hotel. Specialising in exciting wedding food menus, this location is perfect for couples that regard themselves as foodies. Combermere Abbey Estate is dedicated to help you achieve your dream wedding by providing flexibility regarding decorations and colour schemes. Additional features include a ceremony capacity of 86, a dining capacity of 110, and stunning outdoor space. Explore Combermere Abbey Estate here. Thornton Manor Estate is a glamourous and exclusive venue situated in Cheshire. Set on 120 acres, it was first built in the 19th Century and has been designated as a grade II listed building. Thornton Manner offers three of its most gorgeous sites as wedding locations. The Waterside Pavilion is set in an exquisite secret garden location in Thornton Manor's magical woodland dell. The Lakeside Marquee is set in a picturesque Waterside location and is a fabulous outdoor venue to entertain wedding guests. The Walled Garden is set within a secluded 2 acre Walled Garden with appropriate parking. Additionally, ceremony and dining capacity peak at a huge 1000 guests giving any couple plenty of flexibility when it comes to guest lists. Explore Thornton Manner Estate here. 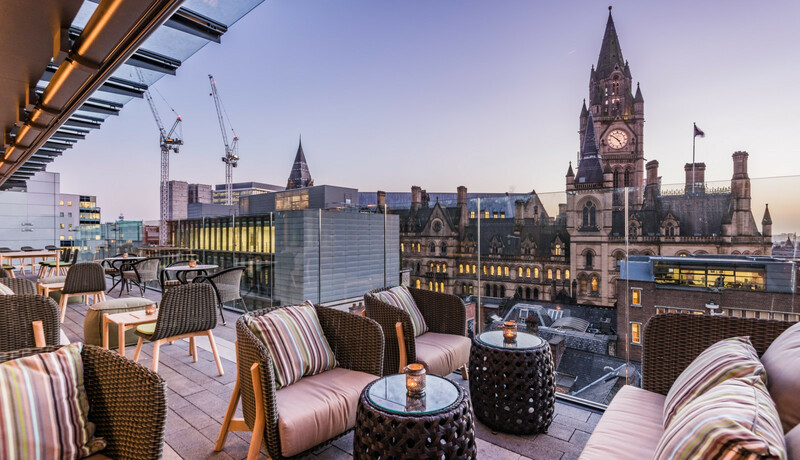 King Street Town House Hotel is glamourous and modern wedding venue situated in the heart of Manchester. Mixing history and modernity, from an Italian renaissance building dating back to 1872 comes the Eclectic Hotel Collection's newest offering, King Street Townhouse. A desirable and versatile wedding venue that's able to accommodate anything from an intimate gathering for close friends and family, to an extravagant wedding breakfast for 100 and reception for 150 guests on the 6th Floor and heated South Terrace which offers incomparable views over Manchester. Explore King Street Town House Hotel here. This Manchester venue is situated at the heart of the resurgent area of Ancoats and Hallé St. Peter’s is a wedding venue to impress. Halle St. Peters is a historic grade II listed church that is guaranteed to wow you and your guests. High ceilings and unique original features create a luxurious atmosphere, where you can sit back and relax as your dreams become reality. This venue offers a ceremony capacity of 200 and a dining capacity of 230. Explore Halle St. Peters here. Eleven Didsbury Park is a modern, glamourous and formal wedding venue in Didsbury, Greater Manchester. As a stunning Victorian villa nestled into this fashionable suburb, Eleven Didsbury Park is guaranteed to create a relaxing and serene wedding atmosphere for you and your guests. This villa has been converted to an incredibly high standard to deliver to its guests a venue full of style, character, and charm. This lovely venue has a dining and ceremony capacity of 80 guests. Explore Eleven Didsbury Park here. If you’re after an English Fairy tale wedding venue then it doesn’t get more fairy tale than Samlesbury Hall. This stunning Lancashire venue dates back to the 14th century and can be exclusively yours for your big day. The original outer façade of the building is the real show stopper and is a fabulous backdrop to any outdoor wedding celebrations or photographs. Ceremony capacity reaches 120 guests and dining capacity is a generous 150 guests. Explore Samlesbury Hall here. Thornton Hall Hotel and Spa is a stunning venue surrounded by gorgeous landscaped gardens that are in the heart of the Wirral countryside. Thornton Hall has decades of wedding experience, a dedicated team to help your vision come to life, and strong links to suppliers to make sure you get only the best on your wedding day. A fantastic bonus to this venue is menu flexibility as the chefs are keen to hear your thoughts and ideas to create your dream menu! Additional features include a ceremony and dining capacity of a huge 500 guests! Explore Thornton Hall Hotel and Spa here. This North East wedding venue is a truly unique and fun one! Catering for rustic, eco, casual and festival themed weddings, The Wellbeing Farm is a fantastic wedding location for couples after a much more laid back and relaxed wedding day. Previous couples have even incorporated Llamas and Alpacas at this venue as an extra bit of fun for themselves and their guests. The farm and its quirky and pretty converted barns are fully licensed which is an added bonus. The farm offers a generous 150 ceremony capacity and 250 dining capacity. Explore The Wellbeing Farm here.